Earlier this month I had the incredible good fortune to visit DOK in Delft, Holland. Normally I would call it the Delft Public Library, but it just goes by the name “DOK” and the sign on the door says it’s a “library concept center.” The staff did this on purpose to get away from the traditional stereotypes of the public library, because the institution they’ve created is about as far away as you can get from the connotation of a 1950s building, filled with quiet people, all of them sitting alone, in a relatively dreary building, being shushed by an old lady with a bun. Instead, it is easily the most colorful and aesthetically-pleasing library I have ever seen. Granted, I’ve seen a very small percentage of the world’s libraries, but the use of a diverse palette of bright and unusual colors was a very stark contrast to every other library I have seen in person or in pictures. Even more impressive (and truly striking) is the amount of radical trust the staff has placed in its patrons. Some of the stark contrast with American libraries is due in part to the litigious nature of our society. Everywhere I went in Delft and in DOK, I found examples of things we could never do in the U.S. out of fear of being sued out of existence. In some cases, it’s as simple as having some of the shelves for childrens books and display cases on wheels so that they can be moved around as needed to create program or play space. The kids can even stand on the bookshelves (as can adults). There’s a room that’s tucked away on the side that truly is built for children, with low benches for sitting and lighting underneath them for little ones who want to read or play on the floor. In another case, it’s the open listening station pods. When I was there, I could hear music drifting through the building from one of them. Some kids would put on an album and let it run while they were elsewhere on the floor talking or playing videogames. It wasn’t overwhelming, though, and there were other places where I couldn’t hear it at all and could sit in silence if I wanted to. The small design touches everywhere are stunning, but that’s not surprising giving the Dutch aesthetic. 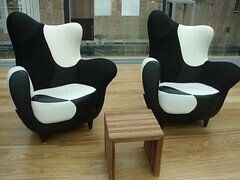 DOK easily has the coolest, most comfortable chairs of any library. As I walked around, I kept sitting in them just because I could and wanted to. Some of them are even practical. Recently, I was in a public library in the U.S. where I had trouble finding a comfortable place to sit. My only choice as an adult was the standard box cushion chair with wood arms. Compared to DOK, furniture used in American libraries is at best corporate and at worst unwelcoming. 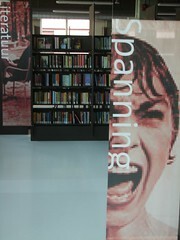 They also use natural language names for sections of the collection (psychology, computers and internet, etc. ), not Dewey numbers, and the graphics for the banners are colorful and eye-catching. They are clearly done by a professional, and they don’t all look the same. Also note the lack of steel shelves that make the library look like a warehouse. 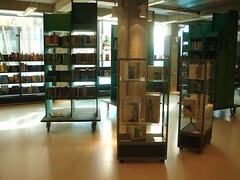 Instead, they used flexible shelving made from recyclable materials (also done for some gorgeous tables and desks). You walk into DOK and you immediately feel welcome into a place you know you can spend hours at if you want to. DOK is what I’ve always wanted libraries to be in terms of the “experience” that happens around books, information, content, media, and people. You can’t help but smile when you’re inside, and you just feel happier in general. A couple of years ago, I heard a speaker at a Minnesota Library Association conference say that the classic mistake libraries make is that we focus too much on how we want people to feel about the library when they walk in. His theory was that we need to focus on how people feel about themselves when they walk in, and DOK illustrates that theory in practice. Each time I entered the building, the bright, natural light from the glass ceiling had an effect on me. If I feel better about myself there, I will feel better about the library and enjoy my experience more. DOK’s Director, Eppo, told us that “libraries are (for the most part) all about not having fun.” At DOK, they deliberately turned this stereotype on its head. Instead, their theory is that “life is all about having more fun than you can think of, and it starts at the library.” So they have videogames, listening stations, comfortable chairs, a cafe, a circulating art collection, programs throughout the building (not just hidden away in a room in the basement), a piano, toys for kids to play with, a brightly-lit room devoted to graphic novels, an entire room (done in red) devoted to romance novels, and more. When you walk in the building for the first time, if your cellphone is discoverable via bluetooth, you’ll receive a text message from DOK that says, “Welcome to the most modern library in the world,” a claim well-lived up to. There’s an RFID system for both library cards and books (with no privacy problems to date). There’s a system of LCD screens mounted around the building for navigation and information which runs off Nintendo Wiis. The display is a Flash application of a Wii channel and the top bar’s information and color changes based on your location in the library. Staff can log in to a website to change what shows on the display in order to update messages for the public (about programs, closings, etc.). The afore-mentioned listening station pods are truly amazing, and I now have to find a way to fund one for my home. Plans for later this year call for the installation of a multimedia creation area for podcasting/vidcasting/etc. and a “genius bar” type of setup for technology help for the public. None of which precludes the provision of and help finding print materials and reference help. 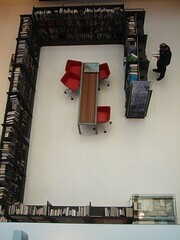 Staff are smartly situated throughout the building, and books are everywhere. 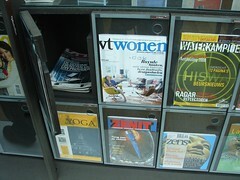 Magazines and newspapers are easily accessible, housed in a brilliant design of cubes that makes the most current edition visible and recent issues available without staff intervention. While there are flyers and handouts on top of various shelving, the walls are not plastered with handmade signs of rules and navigation. Of course, there isn’t a single “no cell phones” sign to be found since they actually communicate with patrons via mobile devices. I could go on all day about how DOK gets the big things and the details right, but you can see some of this for yourself in my Flickr set. It is everything the big, fancy American libraries want to be but just miss. 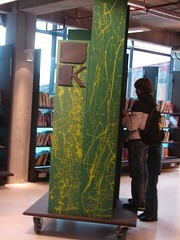 If your library is planning a new building or a renovation, I highly recommend you talk to the people at DOK and if at all possible, visit this amazing library. You will be amazed at how much better than a bookstore a library can be at merchandising and aesthetics, let alone the social experience. Addendum: Even better pictures from the DOK folks themselves here, and an article in Marketing Library Services about innovation at DOK here. There are a lot of fantastic ideas here, thank you for sharing! how amazing! Thank you for posting this. They are building a new library for our school and it looks nothing like this…but it would be amazing if it did. Amazing looking. 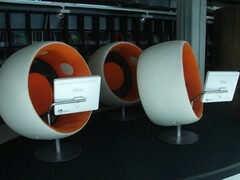 I love those iMac pod stations. Sadly it would look really out of place in my house. Many U.S. libraries buy uncomfortable seating on purpose. The sad truth is that if the chairs are comfortable for sitting for long periods, they will be monopolized by the homeless, who will treat the area as a flophouse. Furthermore, if you do find comfy chairs in a major U.S. library, don’t sit in them unless you want to subject yourself to lice, tuberculosis, etc. I was there recently too, an amazing place! Establishing the library as a desirable PLACE to BE is the design challenge for tomorrow’s library buildings. With the proliferation of digital information access portals challanging the very notion of a library with a physical presence, this library facility is a viable prototype for future libraries if they are to survive as relevent physical places in our communities. It looks very nice, but if customers have to pay fees to use it, it’s not really a public library is it? Fab piece Jenny. I am very proud of our Library Concept Center you know that, but you made me even more proud. I do think the place looked better with you in it though. Can not wait to See you in Washington. 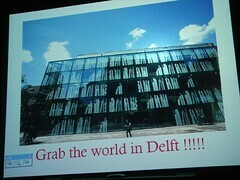 Mr Farrar I can guarantee you that DOK is indeed a public library and is visited by over 80% of the population of Delft. The system with taxes and fees are a bit different over here, but that obviously does not stop people from using this inspiring place as meeting point and place to get aquainted with new technology and new means of sharing stories and information. This can be done in libraries in this country. We just should move away from traditional library vendors. If you look at even the most robust of library furniture vendors, they are not much different than school or office furniture. When you build a new library, the open up some of the cool stuff (not like shown here though). I think library vendors wouldn’t get enough demand to provide it. However, if an innovative library or city would create a deal with Ikea (or something similar) it would be very easy to procure the furniture for the library. A library would have to budget for it and budget to replace the furniture each year when it becomes damaged(also if using Ikea may not last as long as other furniture). Sort of treat it the same way you would books or computers, once they get damaged or destroyed have a piece of the budget carved out to replace it. It isn’t as far out there as one might think. It can be done. How are we to ever get people to realize that libraries are not like the stereotype if everytime we break the stereotype we give it another name!?! Jenny- I was so bummed out that I missed the tour and reading this just makes me think I just have to visit them!!! frankly, i can not understand all the hype, might be due to being german, but this library looks dated to me and there are many libraries like this or even better, in germany, here in france (where i live) or in europe in general! Can you provide more details and pointers for these libraries, andrea? Would love to see pictures and examples of innovation in German and French libraries. If there are other libraries out there that rival DOK, I’d love to know about them. Are they blogging or Flickring or publishing articles about their sites & services? I’ve been to a number of Euro libs and have never seen anything else like DOK. please share more info! This amazing views and natural feelings the library set has prevented the end of library.